Additionally I have been asked about the Avant on a number of occasions, mainly by motorists who have never owned an Audi product but are shopping in the premium class market, particularly an estate car. Combine these personal experiences with the recession beating sales performance of the Audi brand and it is clear that this car maker which continues to push up quality standards and also move the technology ever upwards is getting its message across. During the recent annual Audi range review exercise, where all the latest Audis are gathered for appraisal, I chose to spend most of my time with the latest seventh generation Audi A6 Avant after having waxed strongly during my test with the A6 saloon. My test choice was the 2.0-litre TDI S Line version equipped with Constant Velocity Transmission gearbox with front wheel drive, rather than the more potent and costlier variants. I think this is one of the variants that will keep the hard pressed Audi production lines very busy as it is a good balance between quality motoring and sage economics and thus should win a lot of customers. Unless you are a serious car spotter you would be excused for not recognising this latest car from it predecessor but, believe you me, Audi do not do things by half when they produce a new model and this one, obviously bearing the latest generic frontal styling, is riddled with new technology. For example the construction uses a lot of aluminium to save weight (and provide for future recycling), steel parts are also designed for strength allied to lightness and the wheel base is lengthened by positioning the front wheels further forwards. This 2.0-litre turbo diesel engine really makes sense, combining a very competitive power output of 177 ps (174 bhp) with enormous flexibility, good levels of refinement, above average emission cleanliness (135 g/km) with a combined fuel consumption figure of 55.4 mpg - say invariably over 40 mpg when being well worked. Of course, Audis also prioritises out right performance and this one is said to be good for 134 mph with 62 mph (100 kph) reached in a very competitive 8.5 seconds. So be it, the real performance story is the ability of the CVT transmission to provide a seamless power delivery whatever the situation or when demanded. A satisfying performer that a driver can either take for granted or drive in a more challenging/discerning manner. There is also the contribution to economy/restricted emissions/reduced driver frustration of the stop+start system that cuts the engine if the car is at rest and the brake is applied. The A6 Avant’s concept is a good sized vehicle without being ungainly to manoeuvre (the turning circle is actually very tidy for the size) with impressive comfort for four adults but a fifth in the middle of the back seat being restricted on leg space. Importantly the boot space is very generous with a an unobtrusive lower lip for easy loading and further capacity is obviously achieved by deploying the 60/40% split folding seat back. A sensible innovation is the sliding rail system to enable various sized items to be secured to the boot floor. On the road I immediately appreciated a feel good factor achieved by a satisfyingly comfortable driving position, an impressive yet logical fascia presentation plus a compliant and stable ride. As I expected feel though the controls and responsiveness proved strong factors. The test car admittedly had a £2,000 optional adaptive air suspension system. 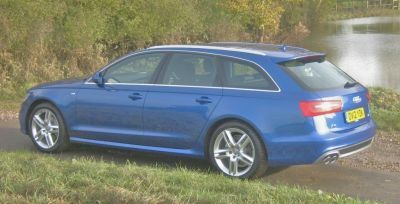 This is just an example of what the latest Audi A6 Avant has on offer, there is a myriad of equipment options and power train alternatives to cater for a diversity of applications but what is obvious to me is that Audi has ‘got the plot’ for a sensible sized estate car by prioritising the product design, build quality and overall performance. Price from £35,385 - as tested £44,415.